Mr. Fox and iunlock like this. Here are some quick shots of it. j95, JoeT44, Arrrrbol and 4 others like this. He also didn't seem to control or monitor his room temperature, and I got the impression he didn't preheat his loop until it reached steady state before doing the comparisons, so I don't think the temperature comparisons are particularly valid. I replied in one of my posts (somewhere in the above link), theorizing that with direct die contact you would probably want to make sure that your water block was completely flat - I think flatness of the water block is more important when using direct die contact due to the small contact patch, whereas with an IHS involved it probably doesn't matter as much if your water block is not totally flat because the heat transfer area is widened & more spread out when using an IHS. What do you reckon to this idea? Have you checked your water block for flatness, I've seen reviewers place the edge of a metal ruler against blocks to look for gaps & unevenness in the surface? 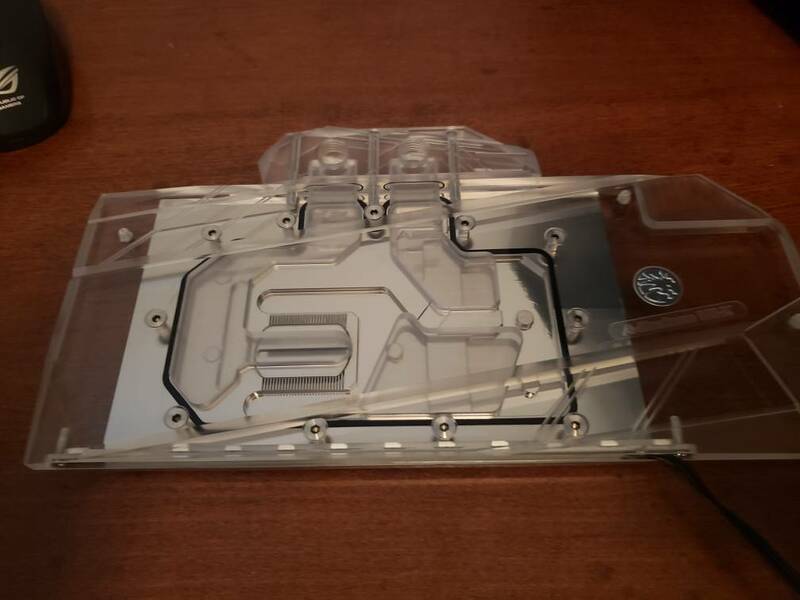 How about lapping the water block surface so it's perfectly flat (+mirror finish)? Correct. With a lot less surface area of the direct die compared to the real estate of an IHS, the tolerance level becomes a lot more important on a direct die. This is very apparent as seen with laptops with its core differentials. This is why I lap the cold plate with laptop heat sinks in order to make sure it's perfect as possible due to the small die surface area, so you're theory is right on as validated from my flight hours of having worked with hundreds of bare die scenarios. On the flip side if the contact point between the die and IHS is off, it could also have the same effect of a die and cold plate being off. The difference is that with a direct die contact it eliminates a variable of the possibility of the die -> contact being off, however, getting the contact points right on a die to cold plate is a lot more sensitive due to it being less forgivable. When using an IHS with the waterblock we would apply LM to both surfaces. With the direct die contact do you think we need not apply it to the waterblock, only the die? Thank you. Yes, what @Papusan said. Always apply it to both contact surfaces. Lapping the water block would be good. It will be interesting to play with. I would be doing the opposite and pre-chilling my loop (as I already do) by removing the radiators (easy with quick disconnect fittings) and letting the chiller circulate water through the CPU and GPU until they reach the lowest possible temperatures with the system turned off. The challenge with so many cores is moving heat off the CPU fast enough, and the IHS seems like the biggest impediment. It seems to act as an insulator under extreme conditions. Will have to be more cautious of condensation with a naked die and chilled water, since the IHS is also like an umbrella. Yes indeed. To add onto my reply above, the IHS being made of copper and with copper having a higher thermal retention rate among the common metals that we deal with in the realm of computers, if the thermal compound between the IHS and block can't dissipate the heat fast enough, there essentially is thermal back up occurring on the IHS. ie... the 'bandwidth' of heat is not able to transfer fast enough. I've analyzed a ton of bench results and when looking at regular water to DICE benchmark stats, the percentage of the thermal dissipation figures, percentage wise, sky rockets as expected, which has led me to the conclusion that everything (flipping point of the ratio of thermal dissipation) changes going from regular water to DICE, significantly. Now that in relation to the TIM used comes to show that even with the very best regular TIM's (non LM), the w/mk is still not enough to effectively come close to a 1:1 thermal transfer rate. As you know LM drops off at around 10C with it being the limit, which has always made me wonder...gosh if Intel only soldered the 9900K correctly lol, we would be golden, but unfortunately their kindergarten solder job still forces guys like us to have to delid. (With the exception of XOC'ers using LN2..the solder is actually beneficial, although it's not the best solder job). It's good that we at least have an option to still take matters into our own hands so cheers to that eh? I was browsing HwBot Radeon firestrike scores, and noticed the guy ranked above me has an invalid score according to 3Dmark. It shows it on his screenshot. Does HwBot accept scores that are invalid? I was always under the impression that it needed to be a valid score to count? Negative ghost rider. You're correct in that an invalid score is not eligible. I've had some of my best runs spit out an invalid result lol..total bummer so I never submitted it. Bro I'm just hoping I can use my windows 7 usb stick that I made with the apex and install 7 on the board. Shouldn't be a problem; both x299 chipsets and I saw one guy on HWBOT with an Omega running W7. Nice. I'll be installing W7 onto my Z390 board this week as I think I've exhausted my regular water runs on W10 on this board, which did impress me but there's nothing like good ol' W7. Yep, in terms of experimentation to compare before naked die with after naked die, then as long as you do the same thing then that's valid - ie you said you pre-chill to lowest possible temps & then run benchmark. As long as everything is the same then you compare before & after. If you lap your water block then do show some pics, mirror finishes are the ultimate photo opportunity! Problem is if you do before & after and the after includes lapping then it's not a true before & after comparison of the benefits of naked die, but that's not the end of the world you'd at least see be able to see the positive effects of both naked die & lapping together. To be honest, given the small contact area with a naked die, I think that goes hand in hand with making sure that everything is as flat as possible, to me it seems like there's no room for errors when you go down that route. Well said, "I think that goes hand in hand with making sure that everything is as flat as possible, to me it seems like there's no room for errors when you go down that route." With the bare die is a lot less forgiving, so being a little bit off translates to a lot. I probably won't do the lapping at first. I will run some Cinebench before installing the die frame at a "typical" overclock like 4.9 or 5.0, record the temps and then install the die frame. The repeat and record the temps running bare die. Then I will play around with max overclock capacity. And, then later on (some point in the future) see what improvement lapping the water block yields. If I do not see as much improvement as I hope to see with bare die, then I will probably be more motivated about trying the water block lapping sooner than later. If the bare die results are amazing, probably won't make it a huge priority. Looking forward to it. Since the surface area of the die is small and with most water blocks being pretty flat, there often isn't a need to lap the block. On the contrary with the IHS having more surface area and usually the bigger culprit over the block itself, lapping the IHS does bring greater benefits with lapping the block being an added bonus. No reason to believe it won't work exactly the same as it always had in the past. ASUS is smarter than that. Not supporting Windows 7 would ultimately mean the death of their success track record among people that love competitive benching. Might have something to do with AMD drivers allowing it to be disabled without detection by 3DMark Systeminfo and NVIDIA drivers detect it with Systeminfo, which allows AMD GPUs to have inflated benchmark scores without being able to tell the mod has been applied. Not sure when it got changed on HWBOT, but the LOD/tess mod is valid for some benchmarks. 3DMark 11, Vantage, Fire Strike, Sky Diver are valid. For Time Spy and some others it is not. You have to look at the rules for each benchmark. I think this is a change from what the rules used to be. So, always check the rules. If you look at the scores for the people at the top of the food chain at HWBOT, their top scores usually have the LOD mod except where prohibited. I only know this because I was trying to figure out why some people had much higher benchmark scores than I did with the same or lower clocks. When I started digging deeper, I found the rules allowed for it. Those that allow it look like crap when you are running them. This is one thing that I wish 3DMark would change in categorizing better, because as it is right now it is complete rubbish. Ex. Most people just look at the total score and completely ignore the form factor of the system that produced the results. Take for example my desktop benches that I've been working on for the past few weeks. If the submitted benches were categorized correctly in a desktop class (on regular water) and not coupled with test bench results and XOC's results, a lot of my scores would be top in its class in respect to its set up and so would other bench(ers) submissions. Nice and congrats mate. I like the transparent intake and outtake section...neat. Johnksss, Arrrrbol, JoeT44 and 4 others like this. Nice. 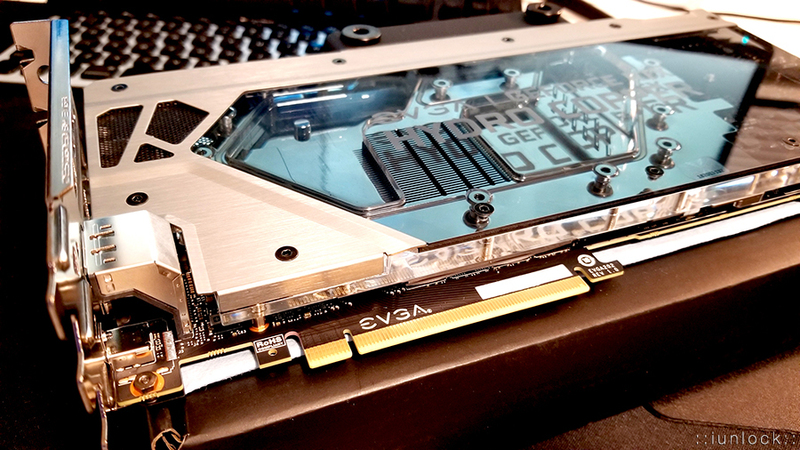 That has some aesthetic similarities to my 2080 Ti Hydrocopper block. Johnksss, Arrrrbol, JoeT44 and 2 others like this. jaybee83, Mr. Fox, Johnksss and 5 others like this. Knocking on 32K's door and that's my personal goal with this desktop. Also, shot past my 40(500) graphics score goal. jaybee83, Mr. Fox, Raiderman and 4 others like this. You are getting getting closer. Papusan, Raiderman and iunlock like this. Once I hit 32K I'm pulling this card out and putting it on the test bench lol. It's a personal mile mark I so badly want to reach in this current form. Hmmm.... I'll keep at it. Papusan, Johnksss, Raiderman and 1 other person like this. Same with this chip. Non Delidded and sitting under ICDiamond. The combined test is is weird one and you will need it in the 13K range to push past 32K I suspect. You can basically tell if the combined test is going to be garbage right when it starts. The FPS needs to be a certain speed when it first starts to run. And generally ends in the 85+fps range on a good run, but that is 5.3 ghz. I'm pretty sure this chip will pull 54+ on desktop board, just not in a laptop. They seem to be locked around 5.2 ghz in here and 5.3 is pushing it. Vasudev, jaybee83, Rage Set and 1 other person like this. It's funny how when you do this long enough you start to notice things eh? I'm usually rooting when the benches start haha..
Vasudev, Johnksss and sa7ina like this.